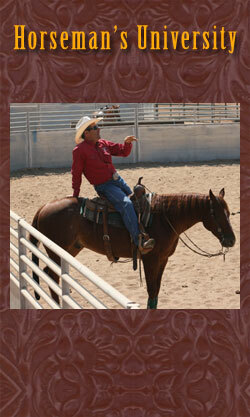 Richard is inviting a very select group of individuals to participate in this thirty-day Horsemanship University. This program is designed for the serious horseman, or woman, who dreams of taking their horsemanship to a new level and focusing on enhancing their horsemanship skills uninterruptedly. University students will work and ride along-side Richard daily, learning invaluable lessons and skills that are needed to enjoy success and reach horsemanship goals. Students are invited to bring a saddle horse or horses will be provided on-site. Our summer clinics will be in session during your stay. Each University student will participate in these events in addition to one-on-one instruction with Richard and Sarah. No more than 6 students will be accepted. A letter and video introduction must be received from each applicant. Students successfully completing the program will be presented a certificate of completion. “What a life-changing month this has been for me! Words are inadequate to describe how much has been accomplished and how encouraged I am. I have been given the foundation to build on to become a better leader for my horse. As an intern, I was able to learn so much in a short period of time. Riding daily, whether with the clinics that were in session or during individual instruction, I was able to practice what I was learning and test my abilities and knowledge, and improve. I am getting clearer in my timing and communication, helping my horse be a winner. I have a lifetime of learning ahead but with a month of coaching under Richard’s watchful eye, patient leadership, and his faith in me, I am much more prepared to put my new skills into practice! Please call Richard or Cheryl at 805-640-0956 to register. Visa and MasterCard accepted.